Ex-Derby Trainman, and now signalman, Tim Helme describes life through the changing seasons at his post on the Derby to Stoke line, where there is much to contemplate between the passing trains. 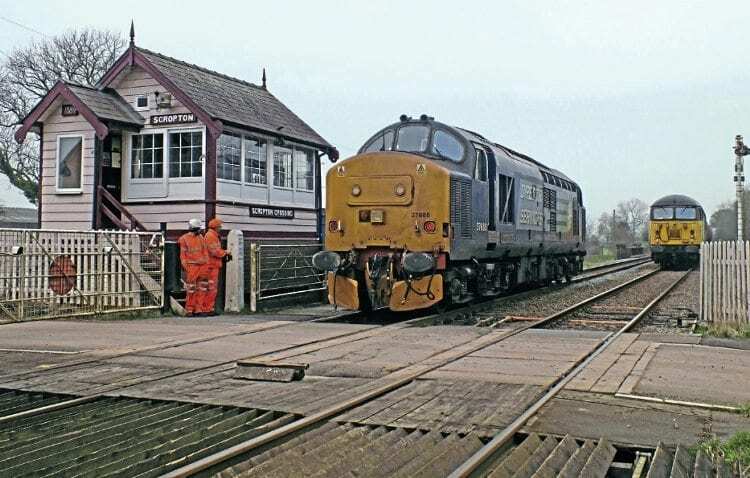 IF you want to conjure up an image of a classic mechanical signalbox, Scropton Crossing may well be it, with cable pull semaphores in both directions, a crossover, and manually-operated crossing gates. As signalman, if you are not swinging on its levers, you are swinging on its gates! The 1884-built ’box controls an absolute block in both directions on the North Staffordshire (Derby-Stoke) Line, east of Uttoxeter between Tutbury and Sudbury. It is situated in semi-rural surroundings, adjacent to the village’s St Paul’s Church and its very distinctive bell tower. Scropton’s frame consists of a distant, home and section lever for each direction, plus three levers for the co-acting crossover and corresponding ground signals. There are also two wicket gate levers, the gate release lever and four spares. All the signals are cable pulls, with the Up Distant 1400 yards and the Down Distant 998 yards away from their home signals. Two good tugs by any stretch of the imagination – or stretch of a cable in this case! The ’box also supervises two user worked crossings: namely Mill Lane and Archers, although the latter is rarely used. As I start this article, I cannot believe I am writing January 1 in the train register book again – another new year! The passenger service runs as normal, but the shift itself is generally quiet as the local populace recovers from the night before. There is still that easy Christmas holiday feeling and spirit of goodwill in the air, but a return to the real world is imminent. In an average year (if there is such a thing), 10,784 trains may pass Scropton, which equates to 32,352 signal lever pulls. The pull for the furthest distant signal alone equates to 70kg (for the metre that the lever is pulled) – which over the year adds up to roughly 755 tonnes pulled just for that one signal. To paraphrase Archimedes: ‘Give me a lever big enough and I will move the world’. It is no surprise that signallers who regularly work here have reasonable upper body development. It is just the rest of the body that leaves a lot to be desired. During ’box hours there will be around 4,642 authorised crossings at the Mill Lane user worked crossing – plus a few that are not authorised. There’s not much to be done about the latter, as some motorists seem to enjoy the Russian roulette aspect of crossing without contacting the signaller – or they simply do not care, but one day their luck will run out. I often wonder if my shift will end prematurely with a loud bang and a plume of smoke rising from that direction, especially as the permissible line speed is 70mph. These selfish motorists are particularly noticeable on dark winter mornings when I go down for the gates. Looking up the tracks towards Mill Lane, I occasionally see the silhouette of a vehicle cross over and it is most unnerving.